Defi Du Seuil had won all of his seven starts last season and was the top juvenile hurdler, but he could never get into a challenging position on his first try over two miles and three and a half furlongs. Karl Thornton's Irish raider Wakea set the pace, closely tracked by Lil Rockerfeller, while Defi Du Seuil was near the back and clouted a hurdle in the straight on the first circuit. Lil Rockerfeller (9-4), trained by Neil King, took over from Wakea after the second-last flight and bounded clear under Trevor Whelan. L'Ami Serge stayed on to claim second place, but was a length and a half down at the line. King said: "That was super. It was very well deserved by the horse. "We started this season without a penalty, which helped. 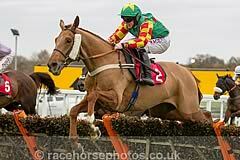 "He is a horse that is better over three miles these days and we will come back for the Long Walk Hurdle now. "We put so much work into him to be spot-on for Wetherby (third in the West Yorkshire Hurdle) but he just needs that first run. "Wetherby doesn't play to his strengths and he needs an uphill finish. "His record round here is impeccable. Sandown and Cheltenham are the other places where he has run his best races." Nicky Henderson said of runner-up L'Ami Serge: "We are staying hurdling and that is a step to what we are going to do. I suspect we will be back next month." Trainer Philip Hobbs said of the vanquished Defi Du Seuil: "At this stage there is no reason for it. Obviously that is not his running. "I didn't want to run at Cheltenham first time out on watered ground, then it was a decision to come here rather than the Greatwood as that was massively competitive. Obviously we are very disappointed."